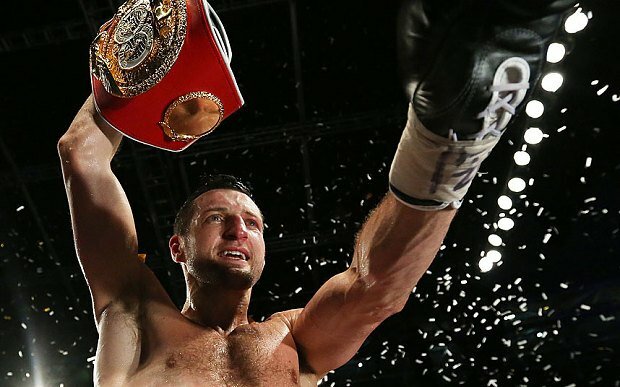 Carl Froch has decided to vacate one of his super-middleweight world titles; he has relinquished the IBF version of the belt which will now see James DeGale fight for the vacant title on April 25th at the O2 Arena in London. Froch won the belt in May 2012 when he beat Lucian Bute, DeGale became the mandatory challenger to the title, but Froch is currently injured. He damaged his elbow while preparing for a potential WBA fight with Julio Cesar Chavez Jr in Las Vegas. Now that Froch has decided to vacate the title, promoter Eddie Hearn is now free to set up a ‘Battle of Britain’ showdown involving James DeGale, who Froch had been ordered to fight by the IBF. DeGale has earned shot with an emphatic stoppage win over Brandon Gonzales last May and he came through November’s potentially risky clash with Marco Antonio Periban, stopping the Mexican. Talks are believed to be on-going with Chavez Jr about rescheduling a fight against Froch, while veteran Bernard Hopkins has emerged as another possible opponent for the 37-year-old. Carl Froch added: “It’s been a frustrating couple of weeks with terms agreed for the Chavez fight only for me to be unable to proceed in camp due to injury. Froch, nicknamed the Cobra, has lost just two of his 35 fights, with 24 of his 33 wins coming by way of knockout.